Emerald Green is the perfectly OZ way to go!! 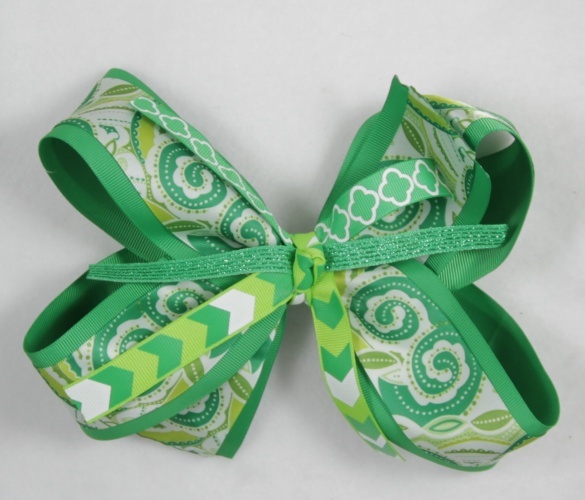 Follow the emerald paisley road to the coolest bow ever! Chevron and Paisley mixed together on top of a green grosgrain bow. The sizes go from 2.25" on the bottom to a 1.5" shimmering satin on the top. There is 7.8' Chevron, diamond patterns and a 5/8" shimmering green ribbons that run through the middle for the flares. All wrapped together by the chevron pattern and attached to a French clip. This is the perfect OZ match to all of your green outfits! Also great for St. Patrick's Day celebration- gotta have green!